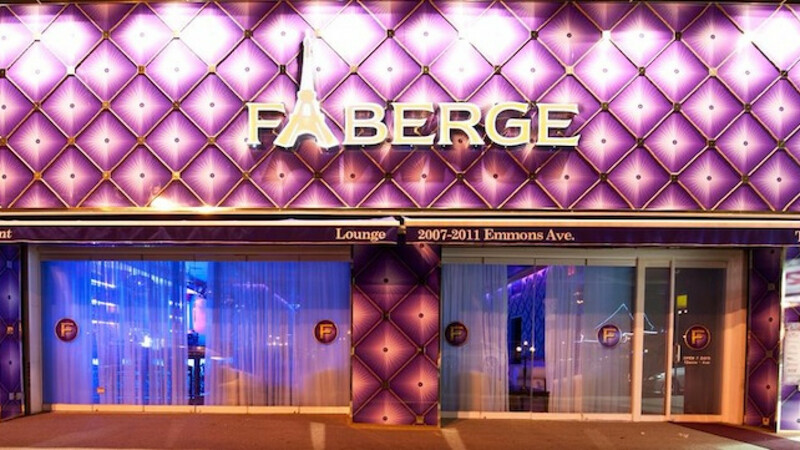 The restaurant Faberge opened last fall in the heavily Russian neighborhood of Sheepshead Bay. Jeweler Fabergé has filed a copyright lawsuit against a New York City restaurant for what it called a "shameless" appropriation of Fabergé's name and distinctive storefront facade of repeated gold and purple diamonds. The restaurant, which opened last fall in the heavily Russian neighborhood of Sheepshead Bay, "is an effort to free-ride on the enormous good will" established by Fabergé and "confuse consumers and members of the general public," according to the lawsuit filed Thursday in a federal court in Brooklyn. Reached by phone, Vladislav Yusufov, the owner of New York's Faberge restaurant, said he had no intention of stealing anything from the iconic jeweler. "We haven't copied nothing from Fabergé. We don't sell jewelry," he said. "We are totally different. Our business is food sale. French and steaks." Unlike the jeweler, the restaurant spells its name without an accent, and has replaced the letter 'A' with the Eiffel Tower in its logo. The luxury jeweler was founded in 1842 in St Petersburg, Russia, and made some 50 of its ornate, jewel-encrusted eggs for the Russian Tsars from 1885 to 1916. Forty-two have survived, and can trade hands for tens of millions of dollars. The restaurant Faberge, which also hosts events, does not sell eggs on its menu.